Earlier this month I had stated that I don't know Coldfusion or ASP.Net. While I still stand by that, as for some reason I've been told that people lie like hell on their resumes, which doesn't not help everyone else who submit honest resumes. Yesterday, I had decided to set up the database a combination of Wordpress and Tumblr. The strength that Tumblr has is its simplicity. They only use tags. Uploading images in blog posts isn't complicated. There is actually a sense of community and audience. Like Facebook, you can like a post, share posts, and follow blogs. However, the search on many of the blog templates is not designed to search within blogs but within Tumblr. Another flaw with Tumblr's search engine is that you can't search for two or more different keywords. All searches are done to look up exact phrases. For example, when you search on Tumblr for "Abraham Lincoln" your search will pull up all posts that are tagged with "Abraham Lincoln" or contain "Abraham Lincoln", but you will not get any "Abraham" or "Lincoln" searches not even if you use wildcards. Tumblr also does not allow you to reply to posts. Instead their solution is for the blog owner to modify the blog template to include a Disqus form on the post page. 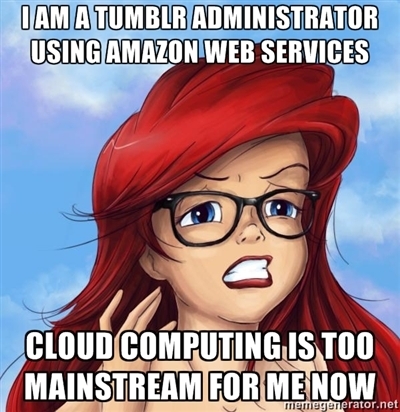 On the other hand, Tumblr uses Amazon Web Services to take care of much of their webhosting. So that is pretty cool. Your average post on Tumblr looks like this. Tumblr's Dashboard feature is an interesting feature. Here you can look up all the saved search tags and see the latests posts by the people you follow. However, it does become necessary to unfollow people after a while especially when their posts flood your dashboard. However, I won't be needed to develop my own dashboard queue. The PHP on my website is marvelous, but I need to get over the hump of using my own MySQL database. I can do it, it's just that I'm new at it. But once I get over my hump, you will see some remarkable changes to this site.